Through a close reading of Mark 6;14-44 Christopher argued that the sacraments are gifts given to the Church to help us understand the way God relates to the world He has created and that the sacraments, particularly the Eucharist, hold implications for the meaning we assign to ourselves as the Church and to our mission in the world around us. Christopher has held pastoral positions in worship and the arts in evangelical and Anabaptist congregations, and now is pastor of Sermon on the Mount Mennonite Church in Sioux Falls, S.D. Everything we value we view with purpose and intentionality. Normally-occurring changes happen in everyone’s lives. These changes often challenge our habits and the things we treasure. Depending on how clearly we understand the meaning of the values we place on people, things and habits, these will either survive the changes or be left behind to make way for the new. There was a time in my life that I was sick and tired of being heavy…chubby…fat. I had battled poor fitness my whole life. Now, as the sun was about to set on my 20’s, I embarked on a fitness and diet routine that helped me to become stronger and slimmer than I had ever been. This new reality was made possible by routines of regular and frequent exercise along with habitual and constant positive eating habits. My daily and weekly schedule reflected my values with purpose and intentionality. Three years later we moved. Along with a new job came new responsibilities, new priorities and new stresses. My new schedule seemed to leave no time for exercise, especially habitual exercise. There was also the strong compulsion to salve my stresses through comfort eating. What happened to my habits? My values changed. Taking care of my new responsibilities meant more to me than taking care of my body. My story makes the point that the value we place on something is based on its meaning. We will craft our daily and weekly schedule to accommodate the things we treasure. However, when change comes into our lives, we will be tempted to surrender the things value, trading them for something that seems more necessary– more meaningful. Jesus was eating the Passover meal with his disciples. While sharing this holy observance, he gave it a new meaning and told us to eat and drink. My purpose is not to promote one of the many interpretations different Christian traditions have ascribed to the Lord’s Supper. Instead, I am making the point that whatever way a church understands the meaning of the Lord’s Supper should lead them to intentionality and purpose with regard to the timing and frequency of the Lord’s Supper. 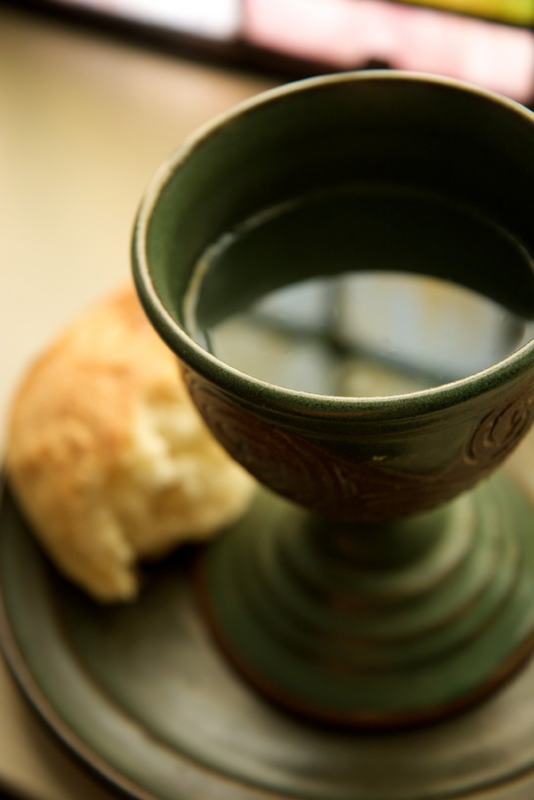 Is any church healthier because it observes the Lord’s Supper less often? Has the frequency of the observance of the Lord’s Supper fallen prey to new things we have decided are more valuable? Are our deeply held traditions concerning the periodicity of the Lord’s Supper being kept for the sake of history rather than their meaning? I believe these questions should be prayerfully answered as we strive to be part of His kingdom coming and His will being done on earth as it is in heaven. Raphael’s “La Disputa” is displayed on one of the frescoed walls of the Signature Room in the Vatican. Here the Holy Trinity (the vertical line of the painting) sovereignly supervises and sanctions the process by which the Church receives the graced Eucharistic revelation. Along two horizontal lines, one in heaven and one on earth, angels and saints discuss the nature of this God-given gift. Of note, along the horizontal earthly line of the fresco, is the clear division between one side of the Altar and Monstrance and the other side. Popes, prelates and people– along with Dante (in the lower right quadrant)– stand on BOTH sides of the discussion. Both attend to the Altar. Both attend to their books. Both have some formal “architecture” of understanding, as illustrated by the divergent structures behind each side of the Altar, to “support” their argument. Both recognize the centrality of Holy Communion– but they are in dispute. Which side is right? To which argument can we affix our name, our signature, our endorsement? Which argument does the Church itself endorse? Within the Church there are a wide diversity of opinions, and hearty disagreements, about this most holy Sacrament. Some, Roman Catholics in particular, endorse the philosophic concept of Transubstantiation. Lutherans embrace Consubstantiation. Calvin and Zwingli have more spiritualized interpretations. Anglicans and Catholics celebrate the “Real Presence,” but are divided about what, exactly, this means. Evangelicals assert a “remembrance,” but often have little understanding about what it means to re–member an event of such significance. Some Christians, sadly, refuse to participate in this Sacrament altogether because they do not want to add to the divisions in the Church. Although there are differences, disagreements, and divisions, there is at least one truth to which all Christians subscribe: Participation in Holy Communion is a directive given by God. 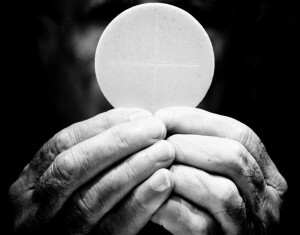 Jesus instituted the Sacrament, and is identified through this breaking of bread. St. Paul affirmed it, and provided clear expectations for participation in it. The early Church, as articulated in Acts 2:42, was known for its commitment to the Table. “DO THIS” is an expectation of God to be taken with the utmost of seriousness. 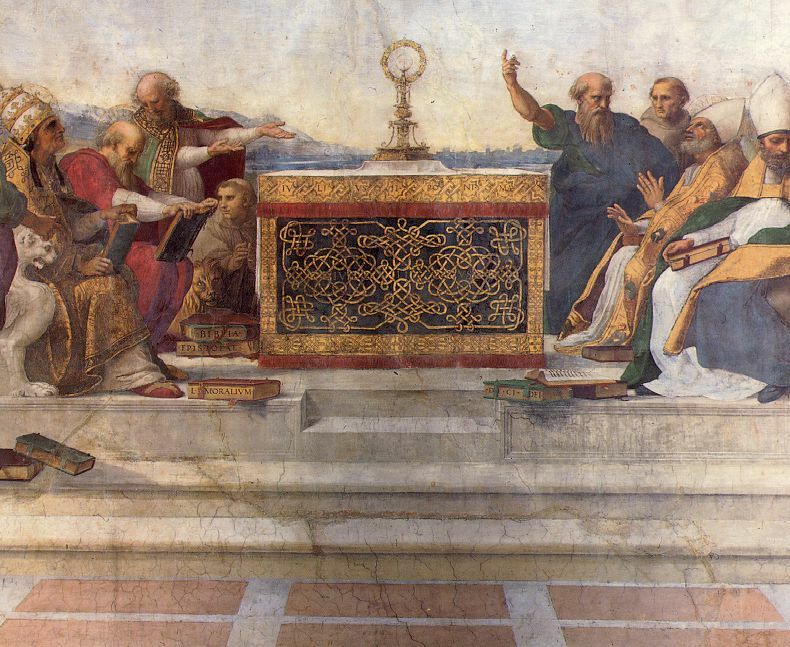 Raphael’s “La Disputa” presents both a heavenly and earthly perspective on this most important Sacrament. 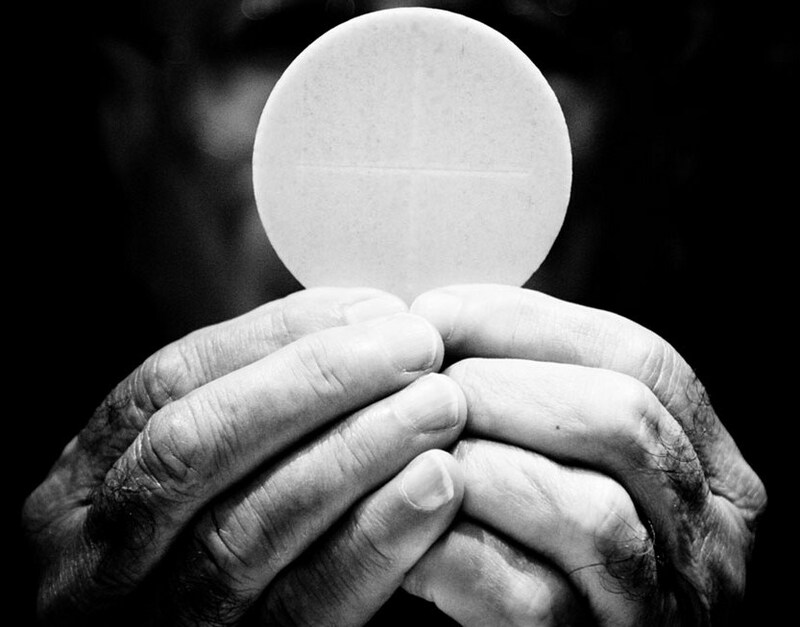 As both earthly (Bread & Wine) and divine (Body & Blood), Eucharist is complicated. There will be, therefore, differences on many levels. But there is one thing we must not differ upon; there is one thing that is not too complicated. Jesus tells us to “DO THIS” and St. Paul tells us that we must evaluate ourselves and our relationships when we do. Will we DO IT or DISPUTE IT? Image above: “The Disputation of the Sacrament,” or “La Disputa.” Raphael, c. 1510. Stanze di Raffaello, Apostolic Palace, Vatican. 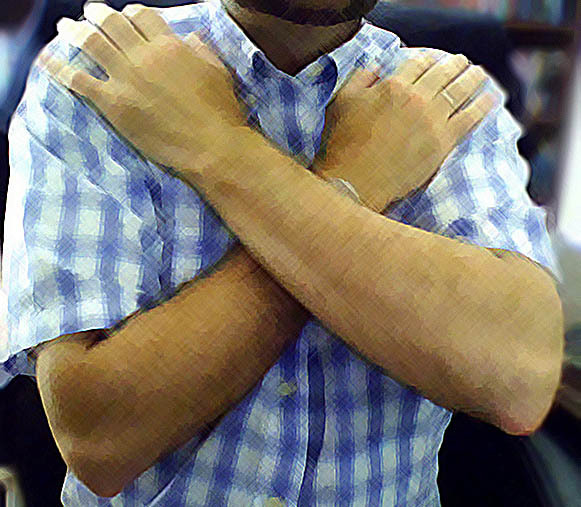 I was refused communion, even though I was known, because I did not belong to their group. I was refused communion, for the same reason, in an entirely different denomination. I was held in suspicion, in third denomination, because I was far too flexible. 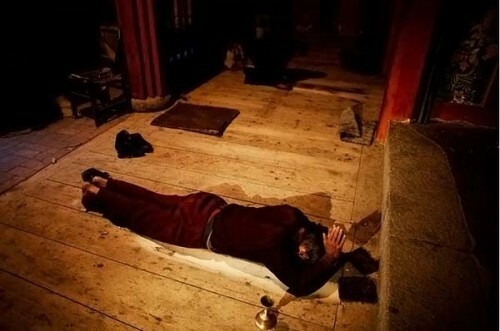 I was held in suspicion, in a forth denomination, because I was not flexible enough. I was refused a pastoral posting that I had essentially clinched when I would not be Republican. I was refused another pastoral posting because, I am sure, I did not say “Prayer Book” like them. I was called demonic by one militant Christian because I challenged “non-essential” doctrine. I was called a heretic in the exact opposite denomination when I expressed a bit of breadth. Recently, by a pastoral friend, I was accused of being too Catholic. This is quite odd because some Catholics I know have told me I am too Protestant. In some churches I am seen as far too “Liberal.” In other settings I am seen as far too “Conservative.” In some churches I am “Conservative” enough, but do not say things EXACTLY as they say them. In other churches I am “Liberal” enough, but do not ENTIRELY hold to their party line. On and on it goes. Is anyone else troubled by these kinds of attitudes and actions? Does anyone else believe that such ideas essentially compromise Christ, the “good news,” and the cause of essential worship and effective evangelism? What is most disturbing about each of these illustrations is that NONE OF THEM involved biblical essentials, barring, maybe one (which could be seen as an interpretational matter). 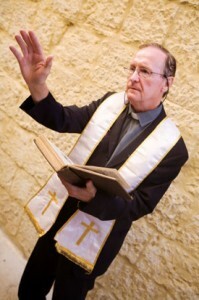 In each of these illustrations I share a common book (Bible), common creeds (Two or Three), common prayer (Lord’s), common morals (Ten Commandments and Sermon on the Mount) and, to some degree, common Sacraments (Baptism and Eucharist being primary, with the other five being, possibly, of practical value). These, to me, are more than enough to build bridges and to share, far more fully, a common life. But let’s think about this for a bit. Let’s examine what is going on. Christians are, together, the body of Christ on this earth. We are the salt and the light. We hold “the keys.” We are ambassadors of Christ’s good news. But what do we do? We anathematize each other, render judgment upon each other, refuse sacramental fellowship, unworthily participate in the Sacrament, and compromise effective proclamation. Shame! Disgrace! Heresy! What shall we do? The Ecumenical Movement, for good and at times for ill, has been around for well over a hundred and fifteen years. Some progress, small progress, has been made; but not anywhere close to what is necessary. While a number of options are available to us, one of which is a mass and united rebellion against the denominational authorities who subvert the Word and work of God, I will propose a far more strident alternative. We need to assert, and radically apply, the strictures of Scriptures regarding Holy Eucharist. In short, apart from extreme circumstances, NO UNITY, NO COMMUNION! Let’s hear what St. Paul says on this matter. All of us are familiar with St. Paul’s words in 1 Corinthians 11. In this chapter Paul clearly and concisely outlines the expectations for The Lord’s Supper. In verses 17 – 32, within the clearly stated context of “divisions,” there are a number of challenges Paul sets before the participants. These are: (1) Be cautious of betrayal, (2) Be aware that it is the Lord’s Supper before it is our Supper, (3) Be alert to our Lord’s command to “do this,” (4) Be discerning, (5) Be aware that this is a covenantal meal, the breaking of which has damning consequences, (6) be insistent upon waiting. Betrayal is the context which Paul cites for the offering and receiving of communion. His illustration clearly references Judas and his kiss of betrayal. The implication, for the Christian community of Corinth, was simple: Their activities betrayed Christ and betrayed the Sacrament. The implications for us are the same, albeit now posed as a question: Do we feign kissing each other ecumenically but, in practice, betray each other by insisting upon our own way? We TALK about unity. We preach about unity. We pray about unity. But we also gather in our own denominational conclaves to cast anathemas upon each other. Arrogant exclusion is behind this. One person insists on his way, another on her way. One party says that they are of Paul, while another says of Peter. The most rank are those who insist they are of Jesus. But beneath this, as Paul says, is the eating and drinking to the exclusion of others. How often do we partake while we exclude others– either immediately in our own assemblies, or in our broader denominational conclaves? 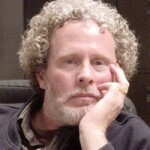 Paul says “NO!” The Body and Blood are “given” for all the body– not for a part of it. It is our Lord’s Supper. He has issued the invitation to all Christians. To exclude is to eat and drink damnation. Obedience is insisted upon. “DO THIS” is what Jesus said, and what St. Paul reiterated. But many churches tell others, not of their stripe, who do not pronounce “shibboleth” in the same manner, NOT TO DO THIS. You can come for a “blessing,” if very lucky, but you are told that you cannot do what Jesus says because you do not say it like the particular denomination insists upon. Some, really arrogant groups, insist that they are NOT exclusive but, rather, they are truly “catholic.” Other Christians are truly welcome– as long as other Christians are “catholic” just like they are “catholic.” In other words: Be us and you will be okay! Ut Unum Sint, indeed! Discernment is called for. We must examine ourselves. We must be assured that we are seeking to build bridges between ourselves and other Christians. We must make sure that we do not come to the “Altar” unconfessed, unforgiven, and unreconciled. This has both local and universal applications. Are we reconciled as a BODY, not just as an “eye,” “ear,” “nose,” “mouth,” or “hand” of a local assembly? Do we invite the Christian– TRULY a Christian– to come and dine at the Lord’s Supper with us? Do we invite them to our pulpits? Do we ask for their input? Or, as I recently experienced, are our sound ideas roundly rejected (even when we cite proper and respected sources) simply because we do not look like or speak like them? Think of this in another context: You are starving. I offer you Bread and Wine for the journey. But, because I use gluten free bread and grape juice, you pass upon the gift and die. Or, again: You come to the Altar of God because you are spiritually hungry, but, because I do not know you, I refuse to feed you. Instead I give the blessing, “be warmed and well fed,” while refusing the covering and food of Christ to you. Makes sense doesn’t it!? ABOMINATION! Covenant is at stake here, and covenant is not to be taken lightly. 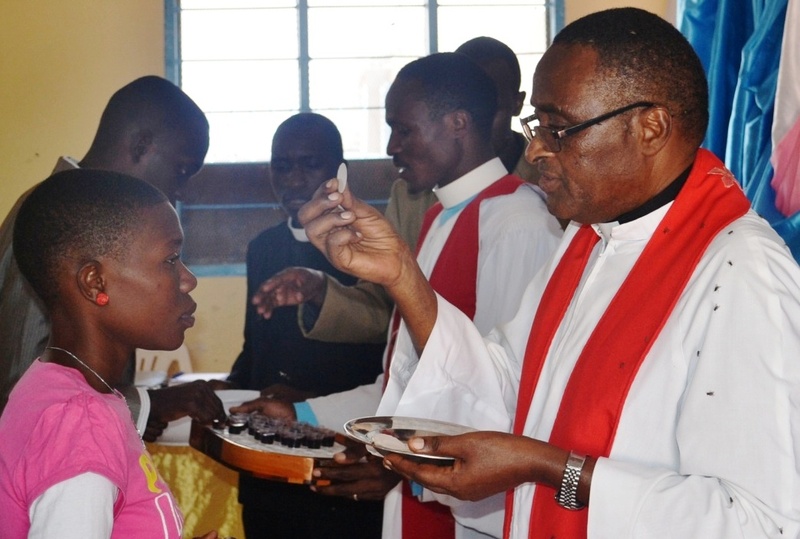 Eucharist is not just a ritual, it is a covenant. Supper is not just a rite, it is a covenant. Table is not just a sacrament, it is a covenant. GOD ESTABLISHED THE COVENANT, and NO human person or institution has a right to abrogate it! And yet, as I go from church to church, assembly to assembly, they disregard God’s own covenantal expectations. At this point I would be wise to outline the concept of covenant. However, wanting to assume the reader’s intelligence, I won’t. It should be sufficient to say that GOD takes covenant seriously, and those who do not do so will reap serious consequences. Waiting may be what is needed; a moratorium on Eucharist asserted and maintained. St. Paul tells us that many people in the Corinthian church became sick because they participated unworthily. Have we ever thought that the sickly state of the Church is due to the unworthy manner in which we have participated in the Sacrament? Let’s not side step the issue! WE ARE NOT RECONCILED, WE DO NOT SEEK PRACTICAL UNITY, WE ASSERT A “PAUL/APPOLOS” ETHIC, WE INSIST THAT OUR WAY IS ALWAYS RIGHT, WE TRAIN OTHERS IN OUR DENOMINATIONAL SELF-RIGHTEOUSNESS, AND WE PARTAKE– UNWORTHILY! We must wait. We must weep. We must stop. 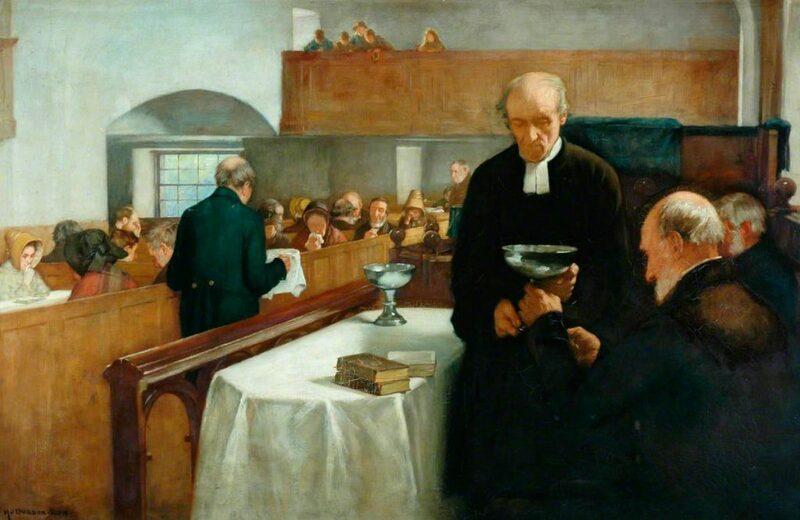 This brief article calls upon all Christian pastors– barring the extremities of First Communion, illness, or Last Rites (or the equivalent)– to stop giving Communion. While such an orientation may take time to entirely implement, it is not entirely out of the question. In fact, strictly speaking, it might be biblical. Millions of people throughout this country and the world receive a benediction, a blessing, at the end of Divine Service. These benedictions take on a variety of forms depending upon each season of the church year, denominational distinctions, or biblically informed personal preferences. One of my favorite benedictions is “Go in peace to love and serve the Lord.” Having received Holy Communion, the Eucharist, love, peace, and service, are commended. In fact, given the nature of Holy Communion, love, peace and service, are not just commended, they are commanded. This is emphasized inSt. Paul’s admonition to the Corinthian Christians who, while highly gifted, often failed to live a graced life. Instead of properly evaluating their responsibilities to other Christians (and the world at large), as participation in Eucharist clearly calls us to do, they exclusively focused upon their own needs.St. Paul suggests that some of their members were overfed while others went hungry. Their self-centered actions were an affront to God and resulted in both personal illness and social discord. The admonition to “love” and “serve” were ignored, Christ’s Lordship was not honored, and peace was compromised. The late Dr. Robert E. Webber has written that any Service of Worship, whether Holy Communion is given weekly or not, should always at some time focus upon Christ’s sacrifice, suffering, and propitiatory death. As such, if Webber’s analysis is correct, this emphasis will always commend and command us to love, peace, and service. Christ’s sacrifice always challenges us about the sacrifices we are called to make in order to effectively be and share Christ’s good news. But how are we to proclaim this peace? How does Christ call us to share? How is Christ’s death (and, of course, resurrection and ascension) to be lived through our lives? St. Francis ofAssisiis purported to have said, “Preach the gospel and, when necessary, use words.” St. Francis makes a good point. Gospel calls us to social action. And this is precisely the problem. How should we act? In what ways should Christians be socially engaged? Frankly, I believe that most Christians have entirely misapplied the Bible’s emphasis about caring for the poor, marginalized, oppressed, and downtrodden. It is not that we have not sought to do so, but, rather, it is the very manner by which we seek to enact change that is (at best) highly suspicious. Reacting to the gross inaction of many evangelical Christians of the late 1950’s – 1970’s, we have now gone to the opposite extreme. A number of years ago my very socially active and aware cousins asked me if I believed in Liberation Theology. I told them that the Bible does not in any way contain a system of thought called Liberation Theology, but that the Bible was very much concerned with a theology of liberation. This led to a very fruitful discussion about the distinctions between the two– and there are very significant distinctions. Christians today often think that social action must be decidedly social. Engaging in a variety of efforts that help others, we believe that we have somehow proclaimed peace. Having taken some action, we naively assume that it is gospel-action. This is not the case. We must proclaim good news through means that are biblically reasonable and responsible. Words and actions are called for, but they must be actions that are properly ordered. Proper social action must be entirely gospel-action or the Bible’s emphasis upon social concern will inevitably be reduced to a form of social gospel. The outcome of doing God’s will in our way, at least in this context, inevitably results in do-gooder Christianity. Such actions are “stillborn” regarding gospel-intention. Let me be blunt. The peace we proclaim through word and deed must always and without exception have evangelism as its intention. Christ must invariably be our emphasis. Consequently, gospel-action of a social nature must have Church at its center. Evangelism must be the actions of the Eucharistic Ecclesia, the Ecclesia which says “go” and “serve” because we have participated freely in Christ’s body and blood “given” for each of us. We go, serve, and proclaiming peace, as Christians who love others because Christ first loved us. His actions prompt ours. While attentiveness to the needs of others is always to be encouraged, it is doing God’s will in God’s way that imbues such actions (by God’s grace) with redemptive value. When we hear benedictions such as, “Go in peace to love and serve the Lord,” we must respond as the Church in Christ’s name. I celebrate the return of social concern and action among youth today. I relish the challenges proposed by those who oppose the status quo of comfortable Christians. I acknowledge my own need to be challenged. Nevertheless, if we are going to take action let us do so in Christ’s name. Let us return to the gospel that is not just social, but, rather, truly good news of Jesus Christ. All social action is not salvific action. All social action is not sanctifying action. To receive a true benediction, we must “go” and “serve” and “love” from the heart of our Eucharist fellowship. The Very Rev. 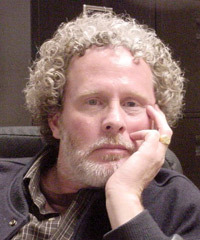 Dr. Donald P. Richmond, is an examining chaplain with the Reformed Episcopal Church, Anglican Church in North America, and a widely published author.